I am a firm believer in spending as much time outdoors as possible; but when the thermometer reads into the triple digits and you break a sweat stepping outside before noon, sometimes it’s best to stay indoors. Heat exhaustion and dehydration are very serious things and can sneak up on kids pretty quickly. Instead of flipping on the TV and letting kids get sucked into the LCD screen coma, try some of these activities that will give their bodies and minds a workout. Grab the blankets, couch cushions and as many pillows as you can find and let the kids go wild. Fort building encourages kids to work on their architecture and problem solving skills. 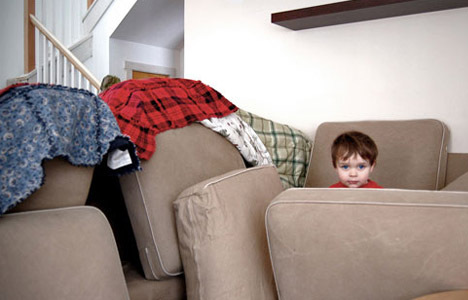 For even more fort fun, turn out the lights and bring out the flashlights so kids can pretend they’re camping indoors. It may make a mess of the living room for a day, but an activity where kids can entertain themselves for hours is well worth it. I can’t stress enough how important it is to invest in a few good board games. Games like Clue, Candyland, and Monopoly never go out of style and when the time comes you’ll be glad you have them! Board games are a great activity for the whole family. Just remember that even though everyone loves to win, try not to get too competitive with kids or they will lose interest pretty quickly. A game that goes by many other names, this can keep both toddlers and kids busy for hours. Since this isn’t 1920 and you’re unlikely to have a thimble lying around, pick any small yet distinguishable object such as a golf ball or a large coin. Take turns being hiders and finders with your kids—one person hides the object and the other directs them to it by uses indicators like warmer and colder as they get closer to or farther from the object, or if it’s a butterfly up high or a snake down low. Encourage your kids to work together to write a play or each come up with their own skit and present it for the family. Kids can dress up and dance to their favorite song, act out a silly scene from a movie, or sing their heart out. Dress-up doesn’t just have to be for girls, costume changes make the whole event more fun for everyone! Getting kids to do chores without complaining is all about the presentation. If you’ve got boxes of old junk in the basement to get rid of like most human beings, send the kids to “discover” what’s inside. Who can find the neatest treasure? Who can find the silliest treasure? You’ll get something checked off your list and the kids will be entertained. Turn your trash into treasure, literally! Anything from milk jugs to egg cartons can be repurposed into crafts. Milk jugs make great bird feeders and lanterns while egg cartons can become the beginnings of an indoor garden. Check out Craft Gossip for an extensive list of recycled crafts. Most memories are digital nowadays making the days of the photo album a thing of the past. But there’s something nostalgic and exciting about a photo print you can physically touch. Buy some photo paper and print out your favorite memories. Cut out pictures and encourage your kids to write out their favorite thing about a certain memory. It will make a great keepsake in time. Remember how exciting it was to find a hand-written letter in your mailbox from a friend or relative? Aside from quick notes in birthday cards, hand-written letters are quickly becoming a dying art. Help your child write a letter to a grandparent or relative and make their day when they open their mailbox. Got the stuck inside and bored blues? Just a few minutes of dancing can help reduce stress and improve your mood. Plus it’s a great way for kids to get rid of pent up energy from being stuck inside all day. Turn on the silliest music you can find (think Purple People Eater) and catch the boogie fever.